This intricate filigree charm resembles a beautiful rosy galaxy - crossing lines of stars in the form of sparkling stones orbit its centre and create a beautiful decorative effect. 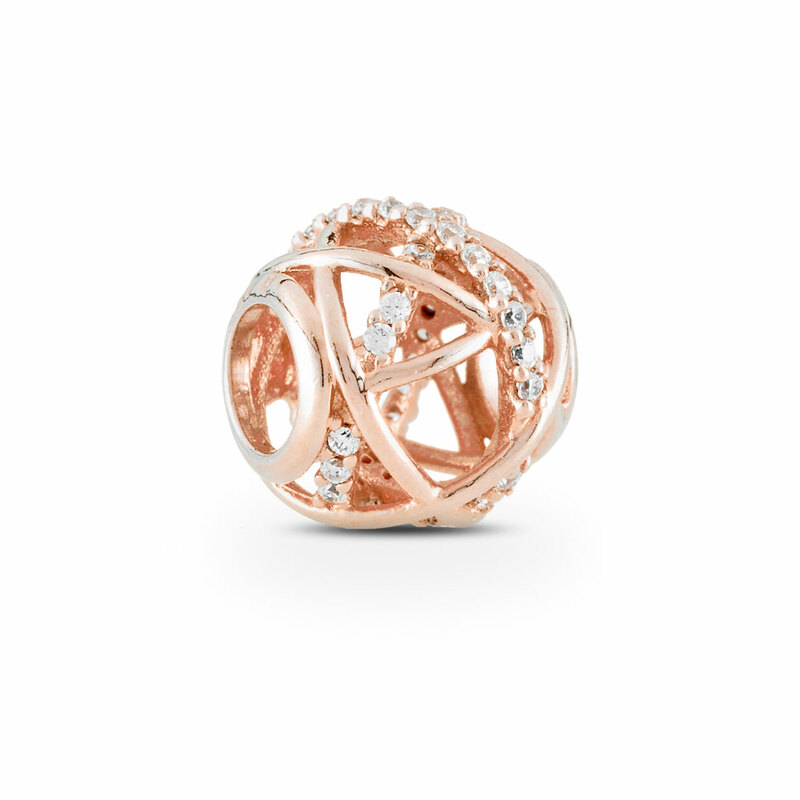 This stunning charm is made up of a unique blend of metals giving it a romantic blush colour. This charm will add some sparkle to your bracelet design, available at concept stores and online.This item is a single charm only. Bracelets sold seperately. Styling images may show this charm on a bracelet as styling inspiration. PANDORA Rose Galaxy Openwork Charm is rated 5.0 out of 5 by 27. Rated 5 out of 5 by Maree from Beautiful charms I purchased the Rose Galaxy Openwork Charm after seeing one a friend had purchased. I am so pleased with the every thing about this charm. It is definitely my favourite. Rated 5 out of 5 by Marie26 from Just beautiful! I bought this charm today for my bangle. It is so beautiful. The picture does not do it justice. I paired it with other clear pave charms and it makes the bracelet look so rich...I love it! Rated 5 out of 5 by Ladyjazz67 from Beautiful charm! I have this charm on my pandora bracelet along with my two round graphite color clips. The beautiful rose gold and stones are a perfect match! Rated 5 out of 5 by Nanasue from Stunning !! Looked BEAUTIFUL on website.was stunning when I received it. Rated 5 out of 5 by Nell1960 from Elegant I love the style of this charm. It is very classy. Rated 5 out of 5 by vanessa85 from Absolutely beautiful The galaxy charm is gorgeous, classy, and delicate. I absolutely love the rose gold.